Blood flow is compromised for some reason, such as cold comb, heart failure, liver failure, and so on poor blood circulationOccurs when they get frost-bitten – if that is the case, covering the comb with Vaseline is common practice. Also occurs when poultry gets stressedThey could have eaten some toxin/poisonSome genetic problem that caused something internal to fail at an early age (likely only if the affected birds were related).Some infection (viral / bacterial) could also be the cause. May be a sign of jaundice / liver disease. Often caused by an infection or toxins (feed, environment, etc.). Avian encephalomyelitis (AE) : Affects young chickens, characterised by central nervous system signs (Epidemic Tremors). Blackhead disease: Blackhead disease (also known simply as blackhead) is a commercially important avian disease that affects chickens, turkeys and other poultry. It is a form of histomoniasis caused by the protozoan parasite Histomonas meleagridis. Blackhead disease affects turkeys more than chickens. The most common symptom of Blackhead disease is yellow watery bird droppings. To reduce the spreading of Blackhead disease, the sick birds must be removed and their litter changed. Crop Mycosis / Trhush - Moniliasis - characterized by whitish thickened areas of the crop and proventriculus, erosions in the gizzard, and inflammation of the vent area. Fatty Liver Hemorrhagic Syndrome: Fatty Liver Hemorrhagic Syndrome is a disease that affects the liver of chickens and other birds. Gallid herpesvirus 1 Also known as Infectious Laryngotracheitis or LT: Gallid herpesvirus 1 (GaHV-1) (also known as Avian herpesvirus 1)is a virus of the family Herpesviridae that causes avian infectious laryngotracheitis. It was originally recognized as a disease of chickens in the United States in 1926. The disease also occurs in pheasants. GaHV-1 is shed in respiratory secretions and transmitted by droplet inhalation. A previously unexposed flock will develop cases for two to eight weeks following introduction. The incubation period is two to eight days. Symptoms include coughing, sneezing, head shaking, lethargy, discharge from the eyes and nostrils (sometimes bloody), and difficulty breathing. The name comes from the severe inflammation of the larynx and trachea. A diphtheritic membrane may form in the trachea, causing obstruction. Mortality is typically less than 15 percent. A vaccine is available, but it does not prevent latent infections. The disease is usually refered to as Infectious laryngotracheitis or simply LT in the poultry industry. It is widely viewed as one of the most contagious viruses that affect the poultry industry. A confirmed case will usually result in the establishment of a quarantine zone around the farm. Inside this quarantine zone, poultry workers will avoid poultry farms to prevent the spread of the virus. Moniliasis (Crop Mycosis, Thrush) - characterized by whitish thickened areas of the crop and proventriculus, erosions in the gizzard, and inflammation of the vent area. Tibial dyschondroplasia: Tibial dyschondroplasia (TD) is a metabolic disease of young poultry that affects the growth of bone and cartilage. Often occurs in broilers (chickens raised for meat) and other poultry which have been bred for fast growth rates. The tibial cartilage does not mature enough to ossify (turn into bone). This leaves the growth plate prone to fracture, infection, and deformed bone development. It is the leading cause of lameness, mortality, and carcass condemnations in commercial poultry. Chickens are also susceptible to parasites, including lice, mites, ticks, fleas, and intestinal Worms. Chickenpox is a disease of humans, not chickens. 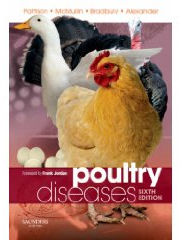 Recommended Action: Should you have a problem with sick poultry, it is important to test and treat any conditions. Those birds that have died should be necropsied to find out the cause and, hopefully, protect the rest of the flock. Your local agriculture department / county vet should be able to do a necropsy on any dead birds. Diseased birds are placed into a big paper bag and either refrigerated (never frozen) and taken to the county vet / agric. dept. as soon as possible.